US First Lady Melania Trump will visit Egypt as part of a four-state tour of Africa next month, her first major solo international trip and first ever visit to the continent. Mrs Trump, the wife of US President Donald Trump, will travel the first week of October and the tour stops will include Ghana, Malawi, Kenya and Egypt, the White House said in a statement Wednesday, with Egypt being the last stop. 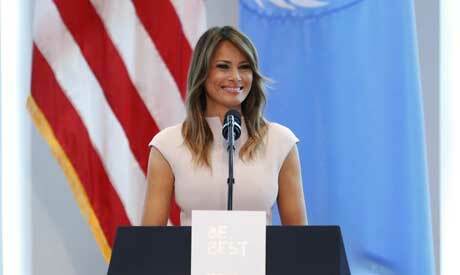 Mrs Trump made remarks about the trip, which will focus on child welfare, at a reception she hosted for the spouses of visiting heads of state and others participating in the annual United Nations General Assembly (UNGA) in New York. "October 1 will mark the first day of my solo visit to four beautiful and very different countries in Africa," she told the gathering, according to a transcript of her speech published by the White House. Mrs Trump said she looks forward to promoting the message of her "Be Best" child welfare campaign during the trip. She said the United States Agency for International Development (USAID) is coordinating the trip, but gave no details about the itinerary or how long it will last. "Whether it is education, drug addiction, hunger, online safety or bullying, poverty or disease, it is too often children who are hit first, and hardest, across the globe," Mrs Trump said. "Each of us hails from a country with its own unique challenges, but I know in my heart we are united by our commitment to raising the next generation to be happy, healthy and morally responsible adults." Her trip will focus on maternal and newborn healthcare, education for children, and US support for each country to achieve self-reliance. In Egypt, the focus will be on tourism and conservation projects. The first ladies of Ghana, Malawi and Kenya attended the event and Mrs Trump recognised each of them individually.